(Swans - August 13, 2007) The old lion is roaring again. He'd left his decades-old hunting fields over three years ago considering that they were not worthy of his kingly self; moved to better northern pastures that quickly disappointed his appetite for royal recognition; retreated back south where he had relatives, in the vicinity of one big zoological encampment; dissatisfied again, he carried his old lioness on his back, using his majestic paws to run to the Zoo itself. There he was, in the midst of over 400,000 potential subjects, confident that his excellence would win him a decent following. It did not happen. There were too many competing roars in the asylum. He grew disenchanted and began looking back upon his old domain with nostalgia. Meanwhile, his replacement, a mere mountain lion, had such a little and unheralded voice that the old following crowd was deserting in droves. The unfortunate creature was getting poorer and hungrier, his subjects unwilling to pay tribute to his would-be kingdom. Licking his wounds while barely surviving, he began asking for a local substitute to come to the fore and take hold of the disappearing tribe, this bird included. No one with an ounce of fatness and an inch of brainess would respond to his call. Poor mountain lion was being spotted with his skin barely topping his bones. Turkey vultures were circling. He had lost one third of his subjects. He thence commiserated with the old lion, and the noble one was all too happy to become a savior and get back to his old hunting province. Hopping a ride in a Toyota Tacoma, he rushed back to his kingdom, roaring and screaming: "Here is my time again, at last, at long last." The community has yet to hear from the mountain lion, who alive and well but wounded, has retreated to his cave to put the house in order and lick his wounds. And so, Bruce Anderson is back in Boonville, once again at the helm of the Anderson Valley Advertiser, having repurchased the paper from David Severn. It happened without much of a whisper in or around early July. You may recall that in early 2004, after much belittling of Mendocino County and the Anderson Valley -- "it is doomed," he'd say and write repetitively -- Bruce and Ling Anderson sold the paper and their house and moved to Eugene, Oregon. He had bought the rag in 1984 for $20,000 or the equivalent of $36,360 in 2004 if one applies the Consumer Price Index. (1) Being the great financier that he is -- and finding no taker -- he sold the paper for $20k to David Severn, an old hippie turned grumpy populist. With the $20k in his pocket, Bruce launched the AVA Oregon in the fall of that year, disappointing if not angering Severn, who was already struggling with his new acquisition. 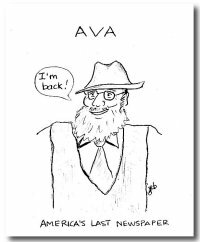 The AVA Oregon was essentially an AVA redux. Former AVA contributors moved to Bruce's publication. Quite possibly, former subscribers, especially out-of-state ones, did not renew their subscriptions and followed Bruce too. Severn was hurting, but so was Anderson. The latter had counted on a $40k settlement with Mendocino County in a court case he had handily won. He won all right, but the money never showed up as the judgment was overturned in appellate court. Three months later, he ran out of operating capital, folded the paper, and got out of sight and voice. He reappeared months later in Marin County, north of San Francisco, where he looked after his ailing mother and worked on two manuscripts on the history of Mendocino County. Sometime, somehow, the house in Eugene was sold. All the while in Boonville the AVA was becoming a bit of a humorless bore in spite of Severn's valiant efforts. The paper was hemorrhaging from reduced readership. To keep it in the black, Severn decided to cut the pagination from 12 to 8 pages (see my Blips #42) -- and he was getting tired. In the fall of 2006, he rhetorically asked me whether I wanted to buy the paper. He wanted out, having done the best job he could and yet unable to leap forward (believe me, I understand the feeling). Then, out of the blue, Bruce Anderson reappeared with a weekly column, "Up Periscope," and a few paragraphs here and there in the "Valley People" section, initially about San Francisco, and slowly, more and more about Mendocino... The Valley went abuzz with rumors and questions. What was going on? Is he back? Had he not moved to Oregon? Conspiracies mushroomed about a devious CIA plot whereby Black Hawk helicopters were moving in. Emile Rossi faulted the government and the County for the demise of the Valley and its cherished paper. Turkey vultures salivated. So many flames were blowing in the wind that ambers were lying all over our little place, forcing me to use the garden hose to squelch the wildfire. Anderson made an attempt to quiet the populace by saying that he simply needed the money, which brought more conspiracies to the fore since the AVA is known for its ever-lasting meagerness. What was up, what was up, people wanted to know. Not being a part of that crowd I can only speculate. Severn wanted out, but could not find a non-commercial taker. Give the man credit. He could have sold to out-of-state corporate interests, yet he always resisted the siren's song. Anderson, on the other hand, could not let his journalistic blood run out of his veins -- the man will die with his hat on, porting his legendary vest, straight on, I.F. Stone-like, or a Marine, I suppose. On July 4, 2007, the paper was his again. Anderson paid Severn $20,000 to save the rag from falling into the wrong hands. Incidentally, poor Severn should have gotten $21,760 to recoup his 2004 "investment" (according to the CPI). Think as you want but both Anderson and Severn must be commended for their romanticism -- they are the type of quixotic individuals that roam the country and try to the best of their abilities to keep us all more or less optimistic. Some Americans do care, although faintly. The first thing the new-old publisher did was to change the mast of the paper. Where it read, "Peace to the cottages! War on the palaces," and "A Newspaper for the rest of us," it now reads, "Comforting the afflicted, afflicting the comfortable," and "America's Last Newspaper." The "comfortable" society evidently does not care a bit about him, and one wonders whether Bruce has ever heard of The Zephyr, or any of the many small-circulation papers around the country. This little pretentious claim aside, he's back in great form, his formidable sense of humor intact, already creating umbrage from his favorite targets, the local bureaucrats and the County Supervisors. He certainly has not lost his edge and sense of outrage. Fun is back! Will the "new" AVA venture perdure? That's a hard one to answer. There appears to be substantial added costs to the enterprise. Anderson and wife Ling eventually moved from Marin County to San Francisco, on 7th Avenue in the Richmond district, where they rented a one bedroom apartment in a building owned by Anderson's wealthy nephew. Ling has washed her hands of the new project. She never liked the idea in the first place, back then, and does not seem to want to get involved again. She is staying in San Francisco, which forces Anderson to drive back and forth from the City to a rented pied-à-terre in Boonville. Since Ling is not managing the office, he has to keep -- and pay -- Saffron Fraser for that job. In addition, he's moved the paper from the "suburbs" to the center of town, in the very building where it took birth in 1955. That's quite a few added operating costs than what he used to face. Well, let's hope for the best. Welcome back, Bruce, and good luck.